Powers/Abilities: Superhuman strength. Able to fly. Nearly invulnerable - bullets and other missiles cannot penetrate her extremely tough skin. Able to swim at superhuman speeds, to breathe underwater, and immune to the cold and pressures of the depths. Able to see better underwater than a normal human. Namora must periodically immerse herself in water to retain her powers and her health. History: (Marvel Mystery Comics #82, ga) A couple of years after the Second World War, Atlantis (in the Silver Age this was changed to Maritanis, an Atlantean outpost) was attacked by surface criminals using a submarine. Prince Namor was absent at the time, but when he returned and discovered the devastation, he could only find one survivor, his cousin, Aquaria Nautica Neptunia. 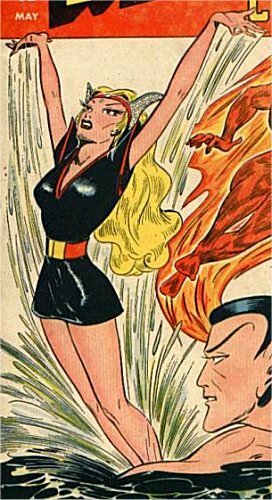 After she had recovered from her injuries, she swore to help Namor avenge their people, changing her name to Namora (Avenging Daughter in Atlantean). (Marvel Mystery Comics 84-87, ga) Synopses unavailable. (Marvel Mystery Comics #88, ga) Namora teamed up with fellow heroines, Sun Girl and Golden Girl. (Citizen V and the V-Battalion II #1) In 1951 Namora attended the funeral of John Falsworth, the Second World War's Union Jack. 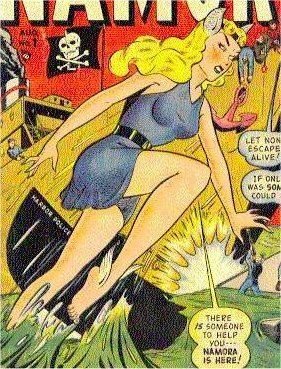 (Marvel: The Lost Generation #2, bts) In the mid-1950's Namora teamed up with a group known as the Monster Hunters. (Marvel: The Lost Generation #2) While with the Monster Hunters, Namora encountered several heroes who would later form another hero team, the First Line. (What If? I #9) In the later 1950's Namora teamed up with a number of other heroes to form a group known as the Avengers (see comments). (Marvel: The Lost Generation #3) Namora searched for her lost cousin Namor, who had been missing for more than six years. (Namor: The Sub-Mariner #20) Having married Talan, then discovered she was unable to have a child, Namora resorted to allowing Atlantean exile Vyrra create a clone of her and implant it in her womb, even though such a thing was banned under Atlantean law. The child she carried would become her "daughter" Namorita. (Sub-Mariner #33, 50, 51, 61, fb) Namora and her family moved to Lemuria. However the evil Lemurian princess Llyra coveted Talan, and seemingly murdered Namora using poison to remove her rival. (Agents of Atlas #3) However, Namora was actually only comatose. Her body was stored in suspended animation, with a "decomposing" hologram used to maintain the pretense of her death, until the Agents of Atlas, her reunited 1950s teammates, found her, and the robot M11 saw through the deception and revived her. Thanks to Jess Nevins for allowing me to use information from his excellent Golden Age Heroes Directory and his Guide to Golden Age Marvel Characters. Thanks also to Richard Boucher & Darrin Wiltshire @ PR-Publications for permission to use information from their equally brilliant collection of Golden Age Sites, PR Publications. Their knowledge of Golden Age characters far outstrips my own. Thanks also to Brad Newman for permission to use images from his Comic Book Cover Quest site on this page.